"This is a traditional Dixie salad that makes Thanksgiving dinner and Christmas dinner great. Kids love this stuff!" 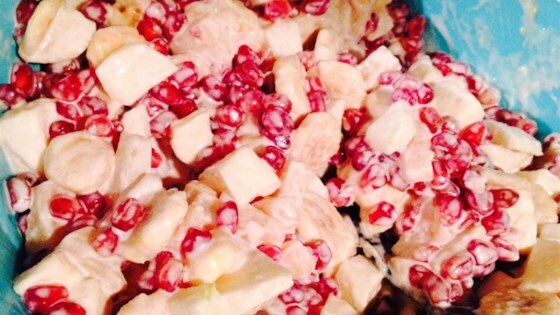 In a large bowl, combine the pomegranate seeds, pineapple, bananas, apples and pecans. Stir in the mayonnaise and salad dressing until evenly coated. Cover and refrigerate overnight before serving. Alot of people in my family hate mayonaise, so I just used cool whip and it came out great. This is a great basic recipe. I really liked the combination of fruits. I used Gala apples unpeeled, left out the pecans, and used Greek vanilla yogurt as dressing . Delicious! sour cream or cool whip are the best dressing for this salad.